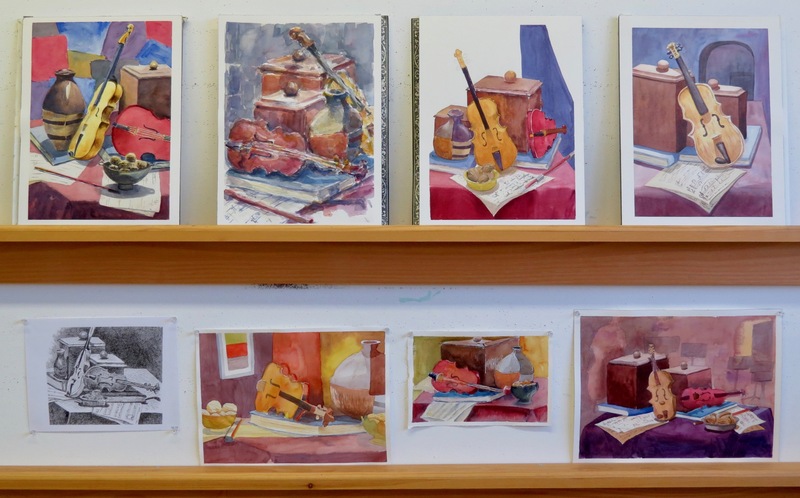 Winter Watercolour Classes at Arts on Adrian – Week One! Step 1) Draw one lantern. Step 2) Adjust the frame of reference/rectangle with masking tape. I didn’t want huge amounts of negative space so the compositions were tightened up in this manner. Step 3) Wet the sheet and randomly touch in primary colours to create a preliminary wash. This was done only on Saturday as those students had much more time to paint. Step 3) Break up the negative space with pencil lines into simple, arbitrary shapes; geometric or organic. Step 4) Select a colour for your lantern. It doesn’t have to be the colour that you’re observing. Mix three or so colours for the negative spaces that enhance the colour of the lantern. Step 5) Paint the negative spaces. Try to vary the washes. Step 6) Paint the lantern. 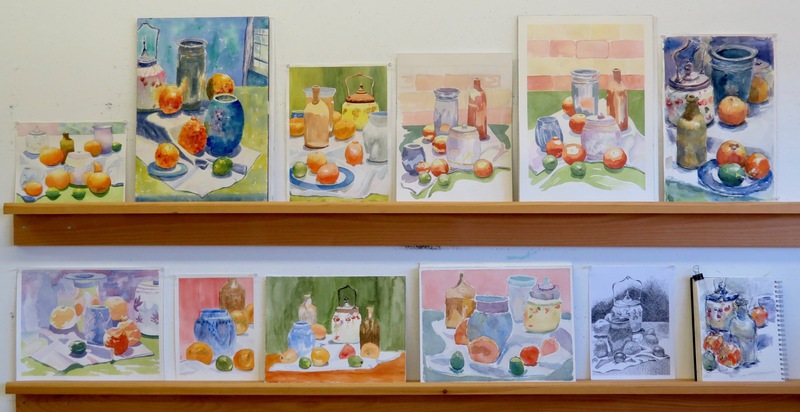 The lighting on the actual still-life may be difficult to understand in places so consider the underlying forms as you paint. That’s more or less the process we followed. I strayed from it a bit as I demonstrated because I wanted to show different ideas without taking the time to complete my painting. Here are a few stages of my demonstration. In the image on the left, you may be able to make out the faint preliminary wash in the ‘white’ areas. Our exercise had a few goals. We attempted to harmonize our colours and to be more interpretative with colour. We sought to establish an effective figure/ground relationship by painting all negative spaces first and not last as is too often the practice. 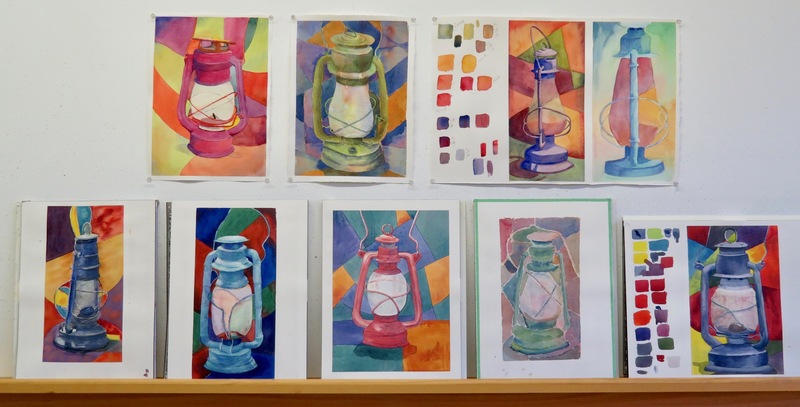 Varying the washes added visual interest and, combined with trying to understand the basic forms of the lanterns, gave the paintings a more natural quality of light. I was pleased to hear that the students really enjoyed our project. They certainly worked hard and with enthusiasm. Have a look at their work and remember to click on a critique image to view a larger version. 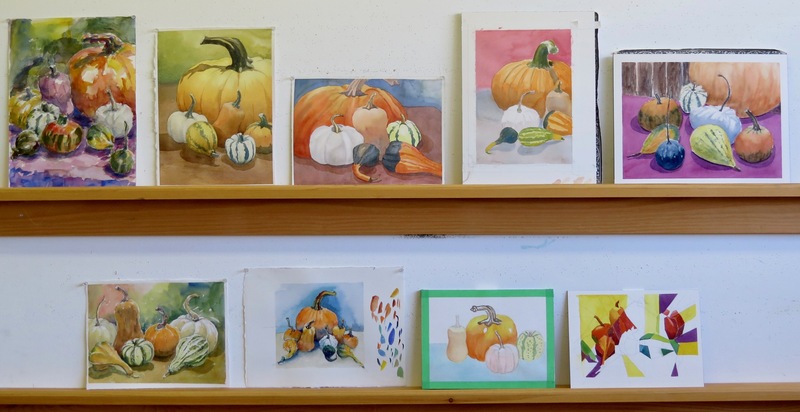 Fall Watercolour Classes at Arts on Adrian – Week Four! I wanted to combine some interesting shapes and textures with rich colours for the final still-life of the fall term at Arts on Adrian. Saturday is an all-day class and I always keep that in mind with my demonstration. The still-life featured decorative patterns in the tea tins and the fabric so I discussed colour selection for those elements of the subject. The black box was started with soft-edge washes before the suggestion of texture. Do candle flames have a crisp or soft edge? Both options were considered. The students did well with the flames although one individual snuffed the candle out. I don’t know if it was a philosophical statement or not. Either way, it was a very creative day. I started off the Tuesday class with a review of the Saturday demonstration. I suggested that the students simplify the patterns of the tins and fabric as they have only half the painting time of the Saturday class. Also, I took a look at the wicker basket on the wine bottle and pointed out it’s underlying volumes and how they receive light. The texture is more meaningful when the volumes are well-understood. More time, please! The still-life had it’s challenges and most of the Tuesday students would have appreciated another hour or so of painting time. I like the way these paintings are going, though. Saturday and Tuesday classes start again in January. I’ll have my Winter Calendar posted on this site soon. Thanks for following and liking our fall classes at Arts on Adrian in the west end of Toronto, Ontario! 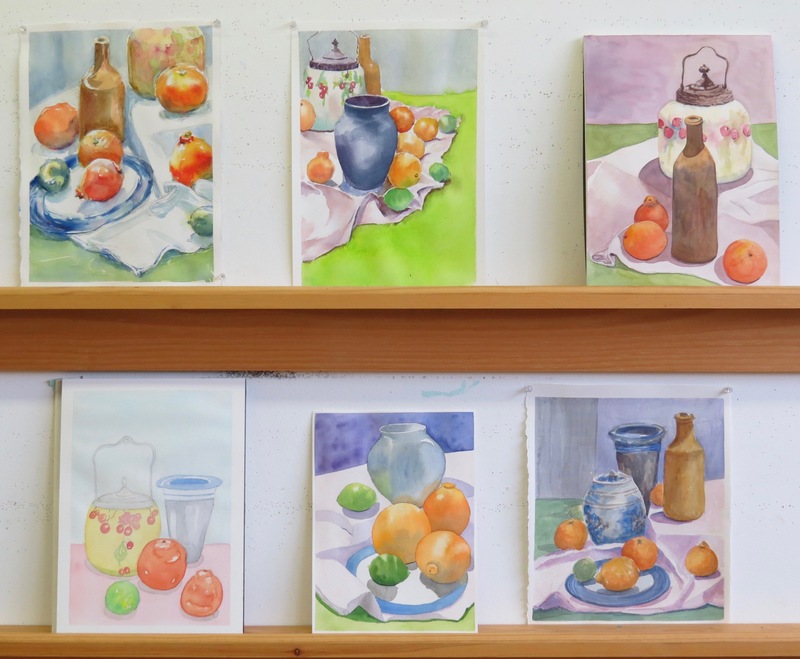 Watercolour Classes at Arts on Adrian – Week Two! The Arts on Adrian students considered this to be a challenging still-life. Lots of objects. Lots of possible compositions and approaches. I talked about a few things to start the Saturday and Tuesday classes. 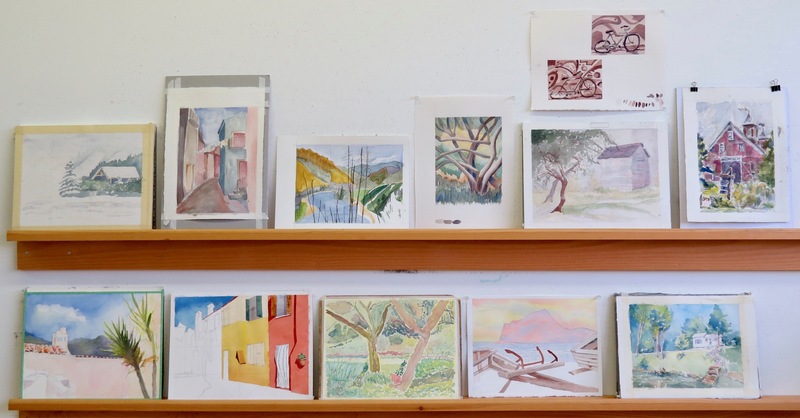 Many of these students are quite experienced watercolour painters and are interested in adding new elements to their work. Following the same process over and over again allows for improvement but varying the process, even risk-taking, is what gives you new ideas. I started out with a pencil drawing. Here’s my most basic planning for my drawing. I refined the drawing and created a small composition. Then, I wet the entire surface with clean water. While wet, I very randomly touched in the primaries; yellow, red and blue. This preliminary wash broke the ice. It crosses the lines and challenged me to work with it. I let the painting dry completely before continuing. As I painted, I used different brush-handling techniques to vary washes. At times, I started a shape with water and added paint. Or I started with paint and gently feathered the edge of the shape with a damp brush. Other washes started with a light value and I added a darker value while it remained wet. In general, I wanted to add interest to all of the shapes in the painting. On Tuesday, I did a bit more work on the small composition. Also, I broke down the shapes of the pitcher to show the techniques I’d employed. I enjoyed looking over shoulders as the students worked on both days. There was a lot of energy in the studio on both days. What do think of their efforts? 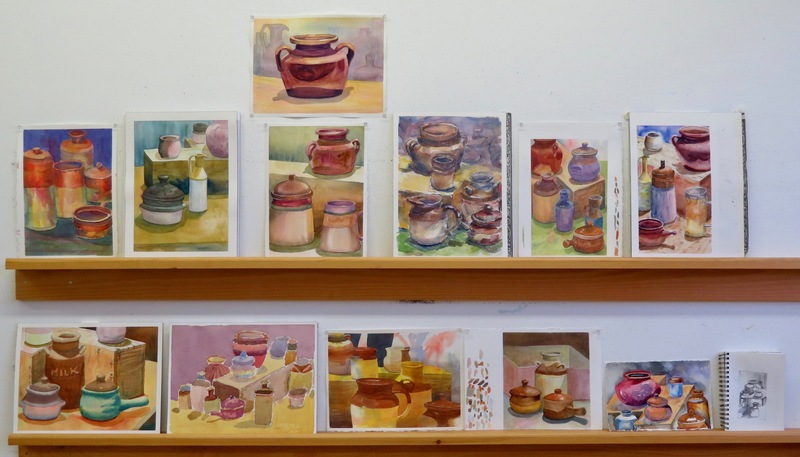 Watercolour Classes at Arts on Adrian This Week! 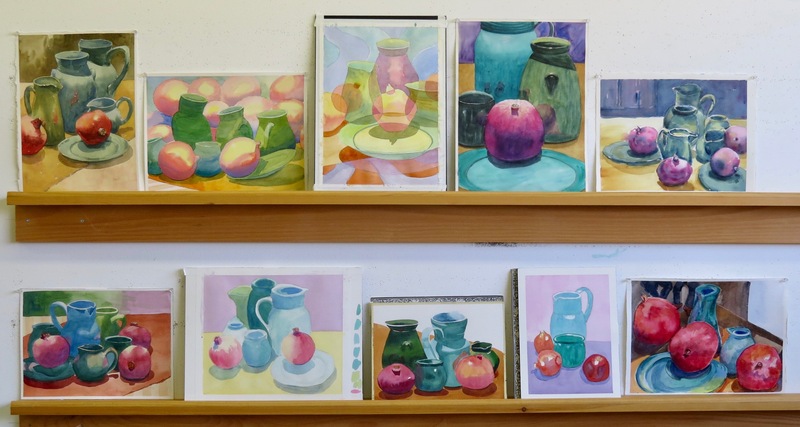 Fall term began last Saturday at the Arts on Adrian studio in the west end of Toronto. 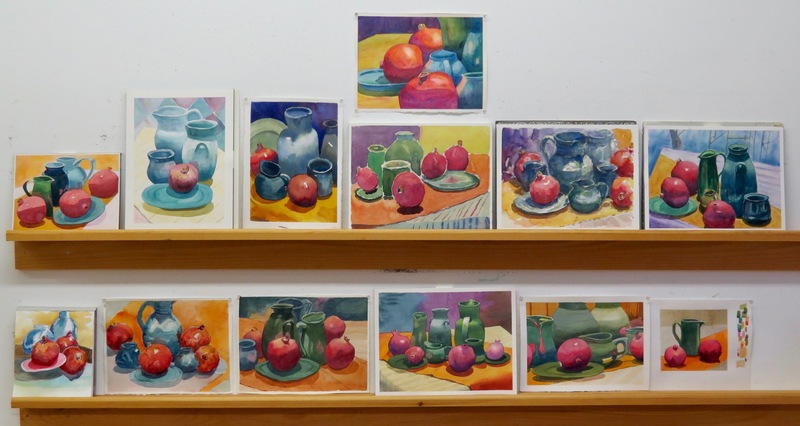 I set up a similar still-life to the one I used recently at the Dundas Valley School of Art. 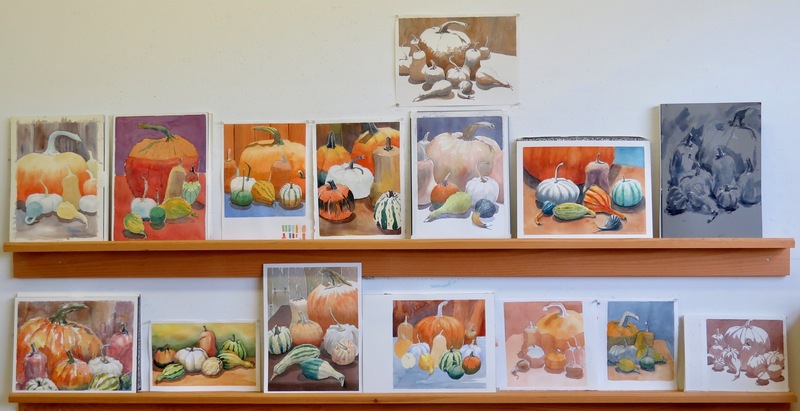 Pumpkins, squashes and gourds; very seasonal and fun to paint. My demonstration for the classes focused on the relationship between drawing and linear composition. In addition to that, I discussed the pattern that is created by a tonal/value understanding of the subject. I also touched on colour mixing for some of these objects. There’s always lots of creative energy in these classes and the work was impressive. I hope you enjoy it. I’ll be back at Arts on Adrian in two weeks! Plein Air Toronto 2018 – Final Two Days! We visited St. James Cathedral in the heart of downtown Toronto on Thursday. The cathedral grounds abut a well-treed park with lovely gardens. I set up to demonstrate and, being day four, asked the participants if they had any pressing questions before we began to paint. The key question concerned the four-value planning studies that had been a theme all week long. It was a good question. I proceeded to paint a small four-value study. You can probably tell that I invented the simple subject but the exercise helped to clarify the process for everyone. We enjoyed a lovely, sunny day with a fresh breeze. The shade of the cathedral wall provided a sheltered spot for our critique. One more day of painting together! We met at St. Michael’s College on the downtown University of Toronto campus. Historic architecture, gardens and public sculpture highlighted the subject matter at this charming and peaceful oasis in the city core. As usual, we met for my demonstration. I followed up on Thursday’s ‘Q and A’ lesson with another discussion of value. Looking at a sun-dappled doorway, I sketched in pencil. Next, I determined my lightest lights and, leaving them as paper-white, I shaded a light middle value everywhere else. The participants were interested in the simplification of a complex subject. I added a bit of a dark middle value and that was enough to communicate the lesson. Later on, I added a wash to further clarify the pattern. Once again, the weather was spectacular and everyone enjoyed the location. All good things come to an end, apparently! It was a wonderful week of creativity and companionship. Have a look at the Friday critique. I thank all of the participants for their hard work and enthusiasm. Thanks for following us. Next stop is Grand Manan Island and that workshop starts on July 29. Care to join us? There are a few spots left. Click here for the details.